The Central American country, Costa Rica, is an incredible place to visit for adventure, wildlife experiences or just hanging by the beach. With a wide range of biodiversity and culture, there is plenty to do for either the adventure loving traveler, beach goers, or the cultural tourist. 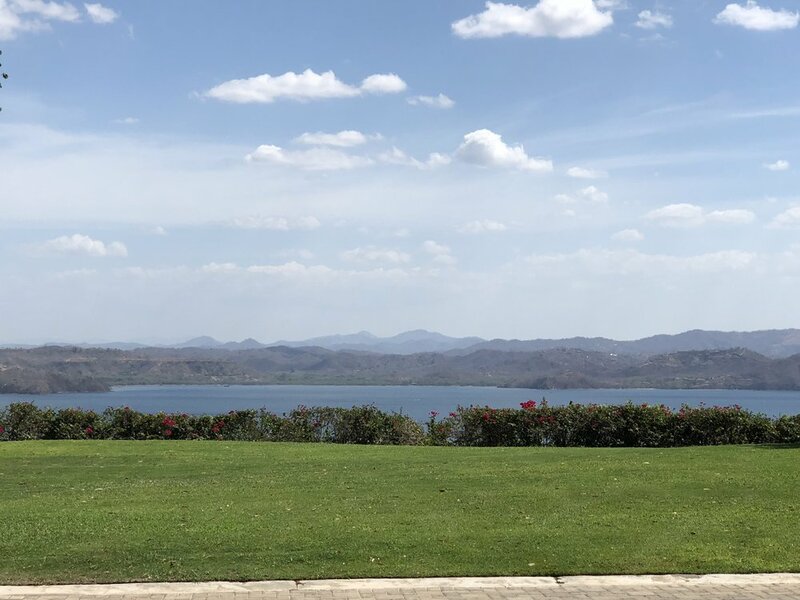 We decided for spring break this year to sample a small portion of the “Pura Vida” lifestyle at the Four Seasons Peninsula Papagayo on the Pacific Coast of Costa Rica. Costa Rica is a small country. At its narrowest spot, there is only 75 miles of land between the Pacific Ocean and the Caribbean Sea. What is so incredible, however, is that in this small country there are 12 distinct life zones or microclimates which include a wide range of scenery: beaches, volcanos, swamps, rainforests and mountains. A visitor could drive two or three hours and feel like they are in a total different country! Costa Rica also sits 8 to 12 degrees North of the Equator so its climate is tropical no matter the season. Costa Rica’s summer or dry season runs from mid- November to early April. The rainy season occurs from April until November; this part of the country flourishes with green vegetation. After a very easy, direct flight from New York to Liberia, we began our Costa Rican adventure. Since it was spring break, we made the decision that we didn’t want to explore different regions (we’ll save that for another trip!) but rather settled into one spot to relax, enjoy the area, and have a few unique experiences. Peninsula Papagayo provided the perfect respite for this! Located on the North Pacific coast in the NW province of Guanacaste, the peninsula was formed long ago by volcanic activity and weather. Today it has 15 miles of coastline which offers 31 different beaches. In all of Costa Rica, the government protects the land. It is mandated that 70% of land must remain natural which protects the land from overdevelopment. The plethora of outdoor activities is a result of this mandate as well. Since we were traveling during the end of the dry season, the landscape was very brown. I can only imagine how gorgeous it is when the landscape turns green! The Four Seasons Peninsula Papagayo is located at the very end of the Peninsula. The drive from the gatehouse is very beautiful as it weaves through natural vegetation, the resort's Arnold Palmer golf course, beautiful homes, and various vistas of the ocean. But more exciting was the wildlife surrounding us. White faced monkeys were perched in trees while iguanas, anteaters, and sloths meandered along the roadside. We learned that traffic is only allowed to travel at 40 km to protect the wildlife living in the area. Arriving at the lobby of the Four Seasons is very impressive. This environmentally friendly resort was recently renovated and exudes the idea of “Pura Vida” (meaning the pure, simple lifestyle). This peaceful feeling begins when you enter the stunning open- air lobby space that serves as the focal point of the resort. I loved the recently redesigned lobby and bar area. They exude the carefree yet sophisticated vibe of the hotel. Whether it was having a cup of tea in the morning or a glass of wine in the evening on these comfortable couches, the hotel made just hanging out a pleasure! Three restaurants were situated below the lobby. All three- Anejo, Baja Grill, and Pesce- provided exquisite food during our entire trip! The golf course features the fourth restaurant, Caracol. The 182-room hotel is newly renovated featuring spacious, peaceful rooms all with views of the water. We loved our spacious two adjoining rooms. The Four Seasons gave us a very warm welcome with this fabulous treat awaiting us in our room! The resort offered lots of different activities each day that you really didn’t need to leave. Every day on a wall by the pool, a large chalkboard listed the various activities. We were looking to start our trip with a bit of relaxation. The pools were the perfect place for this! The three pools (one adult only) each had views of the ocean sitting right in the middle of the two beaches! The views are wonderful. The pools are really the heart of the hotel located right in the center. The hotel has two beaches on either side of the pools. Water sports and countless other water activities like kayaking, paddle boarding, snorkeling, jet skiing and fishing are centered on Playa Blanca. Playa Virador, located right on the Pacific Ocean, offers pure relaxation on fabulous beach beds under the trees. My kids love the pool while I'm a beach lover. At the pool the hotel offered amazing amenities; my daughter loved the frozen treats that came around every day. But the view from my beach chair was truly incredible! Not a water lover- no worries. Kid and teen activities existed all day from nature walks to tie dying t-shirts at both the Kids for all Seasons club and Tuanis Teen Center. The hotel can arrange hikes, nature walks, or golf at its very own Arnold Palmer golf course. My husband and I both very much enjoyed the spa. In addition to fabulous treatments, the plunge pools were so relaxing with views of the beach- pure heaven after an amazing massage! One of our favorite rooms to visit was the gorgeous library. We spent several hours here each day playing some serious chess tournaments and card games. One afternoon my kids attend a presentation with a naturalist from the Discovery Centre. She was wonderful teaching them about the environment in Papagayo as well as the various animals like White Faced Monkeys, Howler Monkeys, Iguanas and Sloths that live around the resort. Attached to the library is another room called La Reserva. This room offers an incredible rum tasting event. A mixologist provides a tasting of a variety of Latin American rums, Guests could sample the rums straight out of the vintage caskets. Thanks to our friends at the resort, my daughter was fortunate to have another amazing baking experience. Katherine spent about 3 hours with Renzo Higa, the pastry chef in Pesce kitchen. She is becoming quite the connoisseur of professional kitchens; this one did not disappoint! While I have been in several major hotel kitchens before with her, this one was truly incredible. It was enormous. We made our way to the pastry room which had its own chocolate room within it. Chef Renzo gave Katherine a detailed tour of the pastry room before teaching her to make her favorite Latin dessert, Churros, as well as THE most delicious brownie dessert ever! She had so much fun and came out with some great new recipes for her growing baking repertoire. Chef Renzo was so gracious and kind. While they waited for her desserts to cook, he also taught her how to make cotton candy and the delicious chocolates we received in our room. She was in heaven learning all of this but even happier about all the sweet samples she tasted. It was truly an amazing baking experience and one of her favorites! It was really hard for me to drag my husband and kids away from the resort; they were so content just relaxing by the pool, playing chess and eating. But I was able to convince them to do one outdoor adventure. So, we headed to Papagayo Canopy Tour for a morning of zip lining. The 30-minutes trip there was an adventure in itself! When we exited the paved road, the rest of the journey was off-roading on a dirt, bumpy road in what seemed like the middle of nowhere. It was really cool! When we arrived at the zip line start, we were very excited. 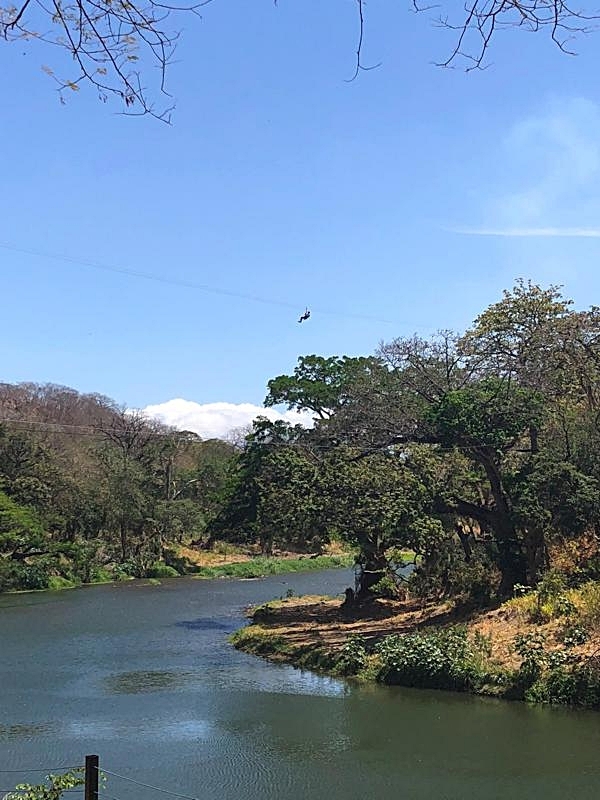 Papagayo Canopy offers 11 zip lines. We were assigned two guides which were very thorough with safety checks as well as our photographers for the tours. The zip lines ranged in size. I was surprised at how high we were as we soared from tree to tree; it was incredible. We felt like monkeys as we flew through the canopy of the trees around the Tempisque River. Towards the end, we crossed the river four times. Each time we searched the river from above for crocodiles. On the last zip line, my daughter and husband actually saw one slithering into the water off a rock! The zip line canopy tour was a really fun morning activity for us. The Four Seasons offers a very special program to give back to the people of Costa Rica, the Growing Together Volunteer Program. Through this program, guests can volunteer for various kinds of volunteer opportunities like helping in a school, environmental conservation, or adopting a child. We opted to participate in the backpack program. Both my son and my daughter bought a backpack at home and filled it with school supplies for two children in Costa Rica. We delivered the bags to the Four Seasons staff who then distribute them. My kids felt happy to give back in a small way to a place that welcomed them warmly! Our trip to Costa Rica provided us with a wonderful mix of relaxation, a little bit of adventure, wonderful unique experiences, and delicious food. While we opted to only experience a little of the adventure of Costa Rica, The Four Seasons provided us with a very memorable Costa Rican experience.